Brig. Gen. George Armstrong Custer taken on or about Jan. 25, 1864, shortly before he returned to his home state of Michigan to marry Elizabeth Bacon. Albumen print from the John Beckendorf collection. The editor summarizes features in this issue, and highlights upcoming plans for issues dedicated to Ohio and Alabama. A letter to the editor is also included. In this second part of the Wallace’s story, the author explains how he found the album and shares key details of the post-war years of Wallace (1844-1928). 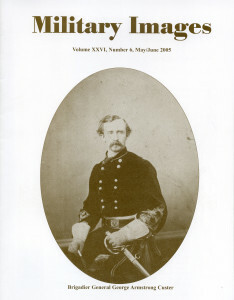 The introduction is illustrated by a carte de visite of Wallace in uniform from the Mike Hogle collection and an albumen print from the Terry Reilly collection of officers of the 5th at Stevensburg, Va., during the winter of 1863-1864. The personal carte de visite album is published in its entirety. It includes 18 wartime images—15 identified images and 3 unidentified. The named men are Capt. Benjamin Axtell, Maj. Crawley P. Dake, Capt. Horace W. Dodge, Capt. George Drake, Capt. George N. Dutcher, Capt. Hiram H. Hall, 2nd Lt. George H. Hill, Capt. Robert F. Judson, Capt. William T. Magoffin, Capt. David Oliphant, Maj. Stephen P. Purdy, Capt. William H. Rolls, Capt. Charles H. Safford and Acting Ensign Robert M. Wagstaff. Two postwar images are also included. The subject is Charles Y. Osburn, and officer in the 5th and a close friend of Maj. Wallace. Civil War soldier, army scout and Wild West performer, Bedford’s story reads more like a Hollywood movie script than a real life narrative. The story is illustrated with three portraits of Bedford (1846-1929) from the author’s collection: An early war tintype, a carte de visite taken shortly after the war, and a late life likeness. Capt. Zabdiel Boylston Adams of the 56th Massachusetts Infantry suffered a serious wound to his left leg and fell into enemy hands during the Battle of the Wilderness, Va., on May 6, 1864. Taken to a makeshift Confederate hospital, he was placed next to an unconscious Union brigadier general. The high-ranking officer was James Wadsworth, who had been mortally wounded in the head by a bullet. After Wadsworth died, Adams cut a lock of the general’s hair. He was eventually released and returned to Boston, where he presented the lock of hair to Wadsworth’s widow. The author recounts how he came to identify a carte de visite of an unnamed soldier published in a 1993 issue of Military Images. The soldier, Arad Wilbar, served in Company E the 102nd Pennsylvania Infantry. He survived wounds on two Virginia battlefield, at Fair Oaks in 1862 and the Wilderness in 1864, and lived until 1926. A follow-up to the author’s first article in this subject in the January-February 1999 issue of Military Images, this survey is introduced with a brief history of hard plate photographs. The rest of the article is divided into sections for mats, preservers and cases, including examples and basic information. In “The Wearing of the Harp,” McAfee traces the Civil War use of Irish harp as an official insignia—or rather the lack of it—in images. He shares scant wartime and a post-war example of soldiers wearing the harp pin and concludes that they were a standard piece of military goods found in the store of the camp sutler. A sixth-plate ambrotype from the Mike Medhurst collection pictures Sam Harris of the 9th Mississippi Infantry. 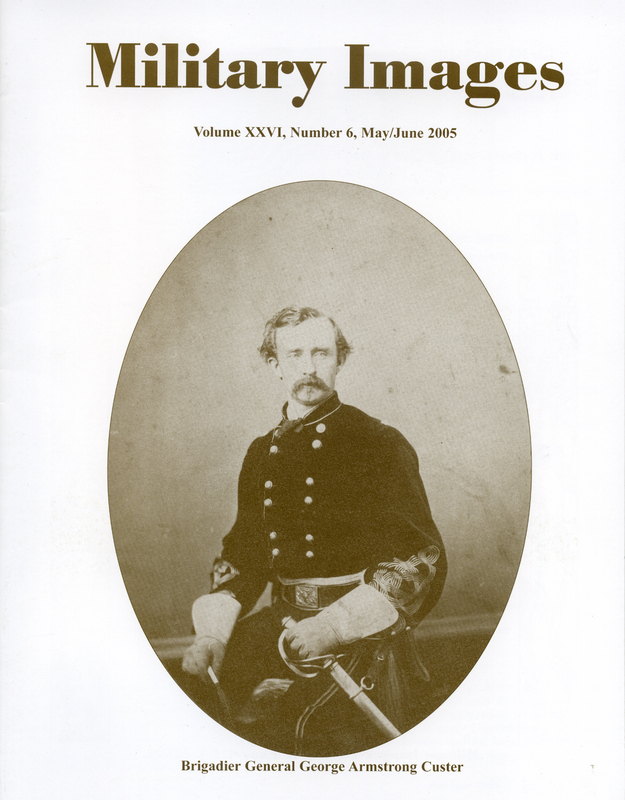 Three images are featured in this issue, including a late war image of an unidentified Union major or lieutenant colonel wearing a 15th Army Corps badge and a mourning ribbon, a group of soldiers in camp and an unidentified sergeant in Company E of the 14th Brooklyn Infantry. An unidentified Union soldier holding a bottle of ‘Oh be joyful” in one hand and a mucket to drink it in the other is the subject of this sixth-plate tintype from the John Robella collection.